Curtainside Conversion kits are the more economical and smartest utilization of your fleet assets when it comes to fulfilling the need for a curtainside trailer. If you already have flatbed trailers in your fleet or if you have access to pre-owned flatbeds that meet your requirements, it can be modified with a curtainside upper structure kit can be custom fitted resulting in a curtainside trailer that makes the whole unit look like brand new. Roland or an authorized installer can prepare your flatbed with reinforced corners and attachment points so that the upper structure will interface with any flatbed make and model. This can typically be done in a matter of three to four days, so the out-of-service time during the modification is minimal. The modification conversion of a flatbed trailer to a curtainside trailer also has a variety of benefits that make sound financial sense. Many times, the asset can be re-depreciated to add net value to your fleet worth. Modification of the existing flatbed with a curtainside conversion kit will be exempt from federal excise tax so long as the flatbed has been in service for more than six months and the cost of the modification does not exceed 75% of the new retail selling price of a comparable curtainside trailer. The flatbed trailer that your drivers are used to pulling is still the same so they are already familiar with the load restraints, weight distribution based on the axle bridge and the particular features of the flatbed. There is familiarity with the durability and historical maintenance of the trailer. 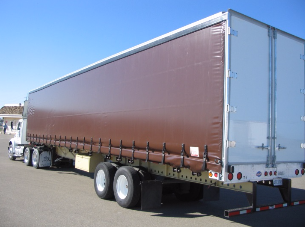 The curtainside conversion kit will only add approximately 2,200 lbs. 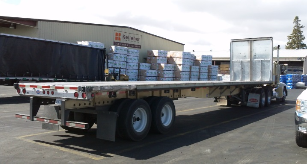 to your existing flatbed weight which in most load configurations will still enable you to maximize your payload weights and other efficiencies such as back-haul opportunities and more time on the road instead of folding tarps.